Trejdify has been online for about 6 months now and its now time to regroup and make sure that we are pushing Trejdify in the best direction. Many companies have the tendency to add features that doesn't fit the underlying business model, mostly because they don't have the time to reflect on what they are doing. Soon they realize that they have gone too far from the original model and are about to fall over the cliff because it's too late to change. The plan is to regroup every 6 month, since we don't want to end up in the cold water below the Golden Gate bridge. Today, we are going to use the book Good to Great by Jim Collins to make sure we are doing the correct decisions. Good to Great is considered to be a classic, and the book is about a research project on how a company can go from a mediocre company to becoming the best company. The author has written several other books with the same theme, including how to build a company that can survive for a long time. "Level 5 leaders channel their ego needs away from themselves and into the larger goal of building a great company. It's not that Level 5 leaders have no ego or self-interest. Indeed, they are incredibly ambitious - but their ambition is first and foremost for the institution, not themselves." First who... then what. This chapter is mostly about people. The point is to first decide who you need, before you decide where you are going with the company. It is also important to remember that employees in general are not important - what you need is A players. If you hire B (or C) players, the A players may move away to another company with A players. Confront the brutal facts. The point of this chapter is to never hide the current truth about your company. If you notice that your customers are running away from you, you need to accept that you have a problem. "Retain absolute faith that you can and will prevail in the end, regardless of the difficulties, and at the same time confront the most brutal facts of your current reality." Culture of discipline. What you need to do is to follow everything from the points above, especially the Hedgehog concept. Ignore all the once-in-a-lifetime opportunities that doesn't fit within the underlying business model. A great company will have many once-in-a-lifetime opportunities. Also make sure that you have a "stop doing" list which is more important than a "to do" list. Technology accelerators. What you need is carefully tested technologies - never use fads. The most important point is that the technology has to fit within the Hedgehog concept. 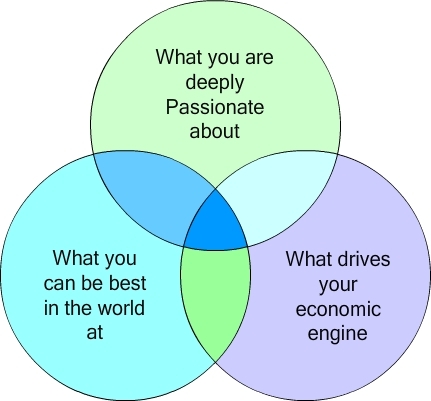 What are you deeply passionate about? We are deeply passionate about the way people reads business news. We generally think that people are reading the wrong news: people are reading short-term news they don't really need, when they should be reading articles they can learn something from. What can you be best in the world at? We can be the best in the world at delivering the best business news. We can't compete with companies like Bloomberg who are delivering all possible news, but we shouldn't either since most people don't need all possible news - they only need the best news. They don't have the time to go though all the regular news items each day after work - they get exhausted by it, so they don't read any news at all. Culture of discipline. This is actually harder than you think. Trejdify used to have a tool section, where you found a Trading simulator and a list with links. Did they fit the Hedgehog concept? No! Technology accelerators. What we need to do here is to test different new technologies. We have tested Twitter before with a good result, so we are going to keep the Twitter account. We are currently testing Google+, Pinterest, and Quora. One other technology that we are going to test is Machine Learning to improve the way we discover business news. 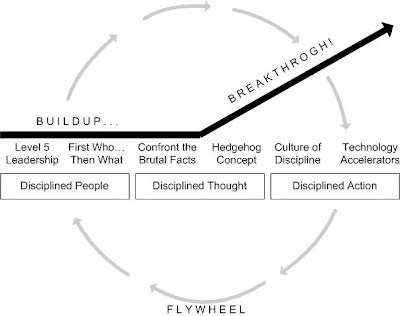 The important point is that all these technologies fit within the Hedgehog concept.